I took it on the famous Tail of the Dragon highway in North Carolina, where it took those 318 curves just like butter. It could benefit from more power, but its super-smooth driving performance will appeal to those who like their sporty sedans to be far over on the civilized side. Find out more in my story at the National Post (Driving.ca). I find the styling changes from the last-generation Jetta to this one aren't as radical as with many makeovers, but this new model is comfortable and a really decent driver. Find out more in my review over at AutoTrader. Fifty years ago, a pushy salesman got Julian Stewart to buy a Volkswagen Beetle he didn't want. Today, it's a prized member of the family. Find out more in my story at the National Post. Volkswagen has an all-new 2.0-litre engine coming out that uses some pretty neat technology to increase torque while reducing fuel consumption, and it's going to first use it in the all-new 2018 Tiguan. I got a chance for a very quick drive it in -- check out my story at the National Post. It's quite a step up in price from the four-cylinder, but I like the V6-powered Passat nevertheless, and if you're going to treat yourself, it's worth a test-drive against the smaller engine. Find out more in my review at AutoTrader. Yes, it's vanilla, but it's damn good vanilla. The Golf is one of those cars where nothing stands out, but it all works together to produce a truly decent driver. Find out more in my review at AutoTrader. It's one of the loveliest cars out there, and gives you the swoopy profile of the Mercedes-Benz CLS or Audi A7 at a fraction of the price. But this is also its swan song...find out more in my review at Autofocus. No diesel, and perhaps never again, but I still like the Passat for its roominess and, in my car, a very sweet V6 engine. Find out more in my review at the National Post. They're a rare breed these days, but I like wagons, and Volkswagen makes a very good one. There's no diesel right now, and no telling when (or if) there will be one again, but it's still a great drive and very practical. Find out more in my review over at the National Post. And to note: This car was named the Best New Family Car for 2016 by the Automobile Journalists Association of Canada - find out more! I'm already a fan of Volkswagen's diesel engine, but when you put it into a Golf Sportwagon, magic happens. Find out more in my review at the Toronto Star. While the 2015 Golf and GTI don't look way-out-there radically-different from the models they replace, the interior and the driving dynamics are considerably improved. Find out more in my report over at the Toronto Star. The new Beetle - which is no longer the New Beetle - is a nice car to drive, but alas, it's lost that funky charm that made the last model so much fun. Read my review in the Toronto Star by clicking here. Volkswagen's Jetta is redesigned for 2011, and while I absolutely love the diesel engine (carried over from the last model), I'm not as impressed with the cheaper interior and feel of the car. Read all about it in Autos.ca by clicking here. From the press release: It features a unique European-tuned suspension and steering matched for handling and improved driving dynamics in the tradition of Volkswagen's German engineering heritage ... Instantly recognizable as a member of the Volkswagen family, with its stylized front grille and exterior treatments ... 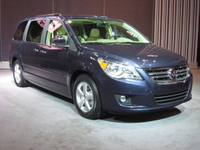 Starting at $27,975, the 2009 Routan becomes the most affordable 7-seat import nameplate van in Canada. Come on, guys. I know the folks at the top want you to play up the German engineering angle, but it's a Chrysler Town & Country with a different badge. We know it. You know we know it. Give us some credit here. Volkswagen has announced that it will build a new plant near Chattanooga, Tennessee, to produce a midsize sedan designed for the North American market. From the press release: Environmental responsibility is a core value of the Volkswagen Group ... As an expression of this shared commitment, the state of Tennessee, Volkswagen and Chattanooga-area organizations are partnering to distribute two saplings for every tree displaced by the project. The new trees will be planted by local school children. The cockles of my heart are warm enough to toast bread right now. Call me a cynic (go ahead, I'll wait), but we're building a manufacturing facility to produce 150,000 gasoline-burning vehicles each year, obviously knocking down some forests to do so, and schoolchildren putting in some saplings is going to make it all better? Frankly, I'm getting a little tired of carbon credits and tree plantings and all the other "feel-good" stuff that tries to make industry look much better than it is. As far as I'm concerned, "green" is the color of my living room walls, and "greening" is not a word. I think I'd have more respect for them if they just said look, it's business, it's going to affect the environment but it's the best we can do. Honesty is always the best policy. I wish VW all the luck in the world with it, but really, what were they thinking? The traditional minivan market used to be a license to print money, but that's all changed. You want to do well in this shrinking segment, you make something really inexpensive, like a base Caravan, or a Hyundai Entourage, or a Kia Sedona, because people know it's just going to end up covered in kidspit and dog hair. Sure, the pricier Honda Odyssey and Toyota Sienna are great pieces of engineering, but those two combined sold just under 22,000 copies last year in Canada, compared to 56,572 Dodge and Chrysler vans. VW should have learned a lesson with the Phaeton, which they wouldn't have been able to keep in stock if they'd released it as an Audi: it's damn tough to sell a $100,000 car that has the same badge as a $16,000 Golf. While pricing hasn't been released, I'm betting the bank that this minivan is going to have a higher sticker than its Caravan twin. Sure, it'll have a nicer interior and "sport-tuned suspension" (be careful you don't tip the groceries when carving corners), but it's a Dodge with a VW badge. Call me crazy, but I think buyers just might figure that out.